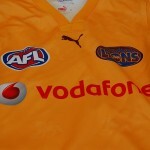 Its off season in the AFL . Hawthorn reign supreme as league premiers . Freo's fairy tale has ended .Rival fans accept their team 's defeats and look to a long summer without footy . Swaps , trades , and drafts is the language bandied around the empty ovals and behind closed doors of club's admin HQ. 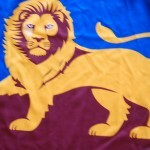 Older players are retired , re-housed, re - hashed and re- branded as they swap clubs and pledge allegiance to another , all for the sake of the mighty dollar , and the welfare of the team .New draftees are selected , young kids with big dreams off playing afl football . 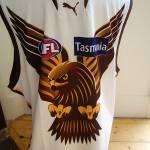 Football jumpers , jerseys , guernseys are changed , rebranded with new sponsors , and washed and packed away til the next season . Or are they ? The vintage styles might need a rest . Stretched , strained , jostled and ridiculed they need some R& R during the off season . 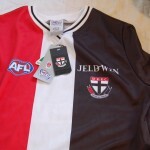 However , the modern , slick , polyester , sleeveless guernsey is good to go anytime , anywhere , anyhow ! A bit like the modern day AFL footballer . , Magpies maraud , Freo flouder , Demons dual , Swans shuffle , Saints subside , Tigers tussle , Power pummel , GWS grovel , Suns shine , Bombers bow , Cats caterwaul , Kangas kick , and Doggies demob . 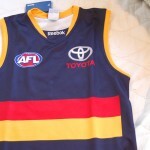 This entry was posted on Sunday, October 13th, 2013 at 4:58 pm	and is filed under AFL, football jumpers. You can follow any responses to this entry through the RSS 2.0 feed. Both comments and pings are currently closed.